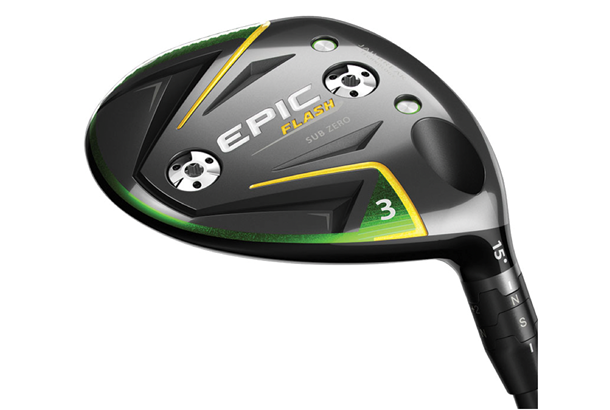 The Epic Flash Sub Zero fairway wood combines groundbreaking new Flash Face technology with precision shot-shaping for high swing speed players. Callaway used Artificial Intelligence (A.I.) and Machine Learning to develop Flash Face technology for the new Epic Flash and Epic Flash Sub Zero drivers. And they've applied what they learned to create an ultra-thin, forged Carpenter 455 steel cup face for Epic Flash fairway woods too. The result is a uniquely designed clubface that’s expressly engineered for high COR across a large area, to promote fast ball speed on both center and off-center hits. 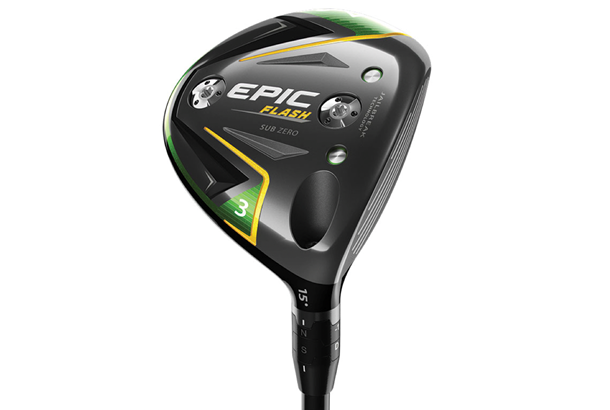 Epic Flash Sub Zero fairway woods incorporate three additional proven performance- enhancing technologies, Jailbreak, adjustable sole weighting and a new, lighter OptiFit Hosel. Jailbreak technology stiffens and stabilizes the crown and sole, allowing the face to take on greater impact load, promoting faster ball speed. And the adjustable sole weighting consists of interchangeable 16g and 2g weights. Installing the heavy weight in the front location promotes lower spin and a flatter trajectory; installing the heavy weight in the back promotes easier launch and a higher trajectory. The new, lighter OptiFit Hosel provides all the adjustability you expect while creating discretionary weight. This saved weight in the hosel allowing Callaway to combine Jailbreak and adjustability for the first time ever in a fairway wood. R&D boss Dr Alan Hocknell told us: "The Flash Face of the fairway looks completely different to the driver, but still embodies the same design principles. "A fairway wood is a lot shallower than a driver, and the usage is different – you hit a bunch of shots off a tee that you might hit more centred, but shots from the fairway will be a little bit lower on the face. So we had to take all that into consideration. "The result is a face that’s still hot from the centre, when you hit it off a tee, but even hotter from the key impact zone low in the face. “So unlike the driver, the thinnest area is low on the face, creating a lot of speed; the centre is relatively thin, too, so there’s sort a face within a face. We were challenged when we first saw it, but we prototyped it and it worked." Switch weight positions (16g and 2g) between front and back ports to adjust launch, spin and trajectory. New, lighter OptiFit hosel design saves weight while offering a wide range of loft and lie adjustability to dial in easier launch and differing flights. The saved weight has allowed Callaway to combine Jailbreak and hosel adjustability for the first time in a fairway wood.